Tue., June 6, 2017, 6:17 p.m.
LeBron James isn’t changing his game, Tyronn Lue isn’t changing his lineup. The Cavaliers aren’t slowing down. Defiant – and some might argue delusional – in the face of a 2-0 deficit to the postseason-perfect Golden State Warriors in the NBA Finals, the defending champions are sticking with their plan. Back home after being outrun and outgunned by the Warriors, who won Games 1 and 2 at Oracle Arena by a combined 41 points, the Cavs find themselves in the same predicament they were in last year. This time, though, the hole feels deeper mostly because Kevin Durant is now leading a team seeking revenge after blowing a 3-1 lead to Cleveland in last year’s Finals. To this point, chapter three of Cleveland vs. Golden State, a Finals dubbed “The Three-Match” has been a mismatch. Still, Lue, the Cavs’ cool-under-pressure coach, believes his team can equal the Warriors’ frenetic pace and flip the script as it did in 2016. “We just have to take care of the basketball,” Lue said Tuesday after the Cavs practiced at Quicken Loans Arena. “I think taking good shots when we’re playing with pace and not turning the basketball over, letting them get out in transition. So that’s our game. We’re not going to change our game because of who we’re playing. And I’m confident that we can play that way, and we did it last year. One of the options Lue has heading into Wednesday’s Game 3 is to bench struggling starting guard J.R. Smith for Iman Shumpert, who played well on defense in Game 2 but wore himself out guarding Durant and needed IV fluids afterward. Smith drained a 3-pointer for the series’ first basket but hasn’t scored since. He’s just 1 of 6 from the field, and for some strange reason, one of the game’s most confident shooters has been hesitant to let his jumper fly. That’s how the Warriors seem to be playing. Golden State’s break-neck speed on offense has been a sight to behold. With unmatched firepower, the Warriors are pushing the pace and the Cavaliers to exhaustion. According to ESPN’s research, the pace of play in the first two games was faster than in any of James’ previous 212 career postseason games. And, the first quarter in which the Warriors outscored the Cavs 40-34 and the teams combined for 130 possessions, was the fastest James’ career – regular or postseason – spanning 5,100 quarters. It’s no wonder James, who has been his typically dominant self, averaging 28.5 points, 13 rebounds and 11 assists, stopped attacking in the second half. He was gassed, and the Cavs couldn’t keep up as the Warriors scored 132 despite 20 turnovers. Cleveland prefers to play at a high tempo as well, and while that would seem to play into a trap with Golden State, Lue and James were adamant the Cavs aren’t pumping their brakes. However, what has to change is production from Cleveland’s role players. 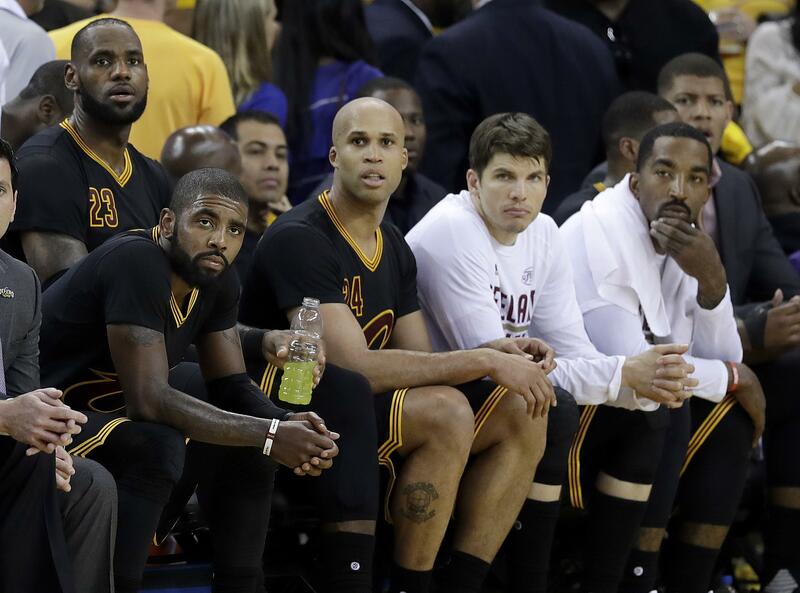 James, Kyrie Irving and Kevin Love are doing their part, but Cleveland’s Big 3 isn’t getting enough support. Tristan Thompson has been neutralized as the Warriors are devoting multiple players to keep Cleveland’s relentless rebounder off the boards. Sharpshooter Kyle Korver is just 1 of 6 on 3s, backup point guard Deron Williams is scoreless in 33 minutes and Richard Jefferson, two weeks shy of his 37th birthday, is the only reserve contributing more than expected. In real time, Cleveland’s two losses in Oakland looked lopsided, but Irving said the tape revealed some positives. Published: June 6, 2017, 6:17 p.m.